When I tacked this poem to a bulletin board in a mother’s center in Detroit, I thought I should explain what I was doing to the woman manning the front desk. Whatever, her face said. 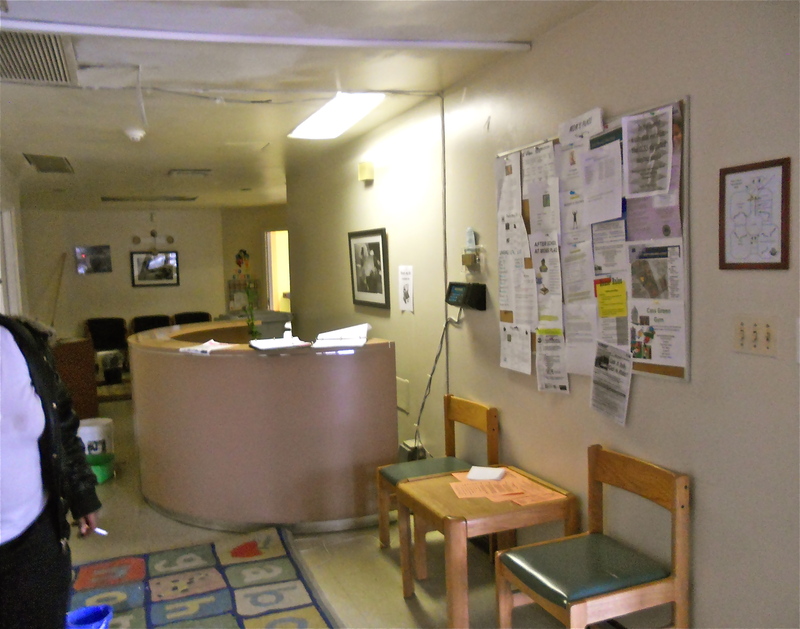 She was more concerned with arranging buckets to catch drips from the center’s leaking roof. I am so embarrassed, my face said back. The contrast in our pursuits was a Marie Antoinette moment for me. I headed back out in the rain as quickly as I could. I had gone to the mother’s center, Mom’s Place, to pick up my daughter from alternative spring break. She had spent a week in the city, cleaning out abandoned buildings, preparing food at a shelter, playing with babies. One day she called me, buoyant and excited. An afternoon with mentally disabled adults had ended with a riotous dance party. Dancing always makes her happy, but connecting with people of other races, classes and mental abilities was a joy for her. Although “I Want to Breathe” is intended as a romantic poem, the longing for intimacy it expresses applies to her dance party experience as well. Another non-romantic version of Laughlin’s longing for intimacy is “The Poop Thing” subplot in Miranda July’s strangely sweet film You and Me and Everyone We Know. I won’t describe The Poop Thing because it would sound much creepier in words than it actually is in the film. You can watch it here but better make sure no one is near when you watch, especially children and anyone easily offended. The length of your lips. 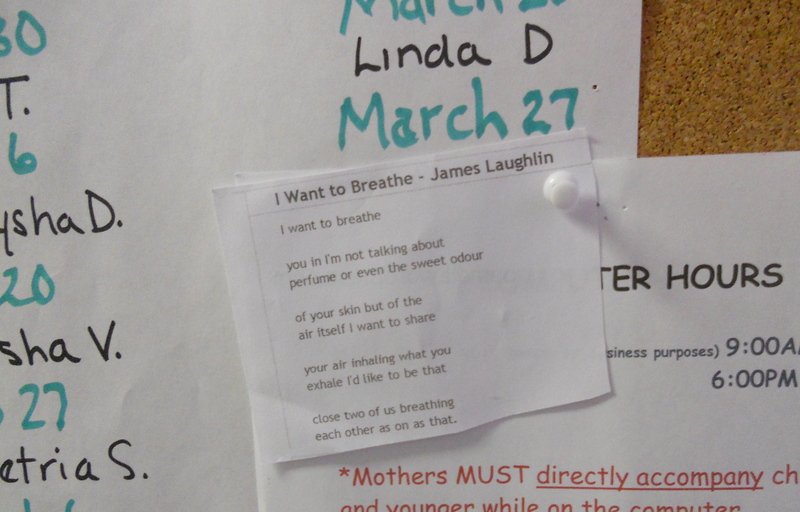 After hanging up “I Want to Breath” at the mother’s center, I realized that the shared breath in the poem could also be a mother-baby connection. How well I remember leaning in face to face with my babies, listening to their tiny breaths, steady inhales and exhales sometimes interrupted by a small shudder as they settled into sleep. After nursing I loved to smell their sweet milky breath, in and out, in and out, calming and quiet. Few moments in life rival that for closeness and intimacy. Laughlin’s poem with its simple language and seamless sentences is dear to me because it speaks of our most soulful need. Don’t we all long for the purity of the intimacy he describes, breath connected to breath, an intimacy free of the masks of class, race, and religion, an intimacy stripped of what we wear, what we own, how we keep up our bodies, an intimacy that connects us to each other at a deep and fundamental level? Well, that’s my vision of heaven anyway. Not the least interested in the steel business, Laughlin was nonetheless grateful for the opportunities his fortune allowed. He took a break from Harvard in his sophomore year, disappointed that modern writers were banned from the classroom, and headed off to Europe. He worked briefly for Gertrude Stein, and then followed Ezra Pound around for six months. Pound told him he would never be a good poet and that he should do “something useful” instead. When Laughlin returned home, Something Useful became New Directions. Despite Pound’s assessment of his talent, Laughlin continued to write poetry, sometimes under a pseudonym. Of his seemingly un-complex style he said, “I like to be understood by ordinary people.” With his fortune, accomplishments, and circle of friends, he might seem far removed from ordinary people. But he suffered depression and his son committed suicide, and that kind of pain grounds people. Perhaps this great poet and publisher would have enjoyed his own “publication” at Mom’s Place.